Fully supported by sponsorships and fundraising efforts in the U.S., Daisy’s Children has established a desperately needed daycare center. The daycare center provides a safe place for children in the village to go to for care, hygiene, and regular nutritional support. It also serves as a funnel to channel preschoolers into a public education at no cost to the parents. In most cases, this daycare center is the only opportunity these children have for food, social interaction, education, and health care during the week. Sponsor the daycare center project. Help children and families receive the education, nutrition, and health care they need. 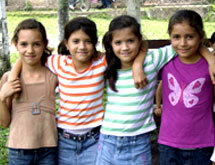 Help change these children’s lives for the better! Through the generous donation of six electric sewing machines and multiple yards of fabric, Daisy’s Children’s sewing center was established. 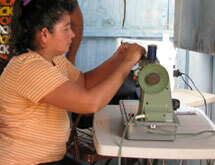 The training at the sewing center is provided by one of the eight original program mothers. The sewing center has been set up to provide education, allowing women of Concepcion and surrounding villages to attain skills to provide clothing for their own children as well as income for their families. All funds raised through the sale of the products made in the sewing center go directly back to support the needs of the sewing center and the women in training. Sponsor the sewing center project and help these women support their families now and learn the skills to provide for their children long term. 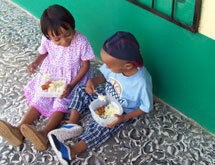 Help these families thrive with a hand up rather than a dependency on a hand out! Initially set up so the families of Daisy’s Children could obtain bottled water, the clean water project is now aiming to provide clean running water through filtration systems in homes. Most of these families do not have access to water at all and cannot provide sanitary drinking water to their children. 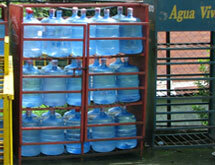 Running water is brought to the families’ homes, allowing them to bathe and do their laundry. The second step is to provide filtration so that the water is then safe to drink through the help of your generous sponsor and donation dollars. Sponsor the clean water project and help families stay healthy and clean. Help change a life!